What Are The Best Essential Oils for Psoriasis And What Is The Best Psoriasis Essential Oil Recipe? Psoriasis is a type of auto-immune disease with inflammatory symptoms resulting in skin disorders that some believe is hereditary. The outcome is raised patches of pink dead skin, which can be extremely painful, though the disease is not at all infectious. The symptoms go downhill with infections, emotional imbalances, stress, or other non-related illnesses. Psoriasis is commonly seen in body parts like chest, elbows, the scalp, and knees. The rash may get worse if it is directly exposed to sunlight for a long period of time and it may also reoccur repeatedly and unexpectedly. Topical treatments can offer instant relief; however, the most effective method of tackling this skin disorder is by adopting an all-natural approach of treatment and treating emotions that may trigger the symptoms. Psoriasis is no different from any other autoimmune condition; they know little about it and they can do little to treat it, except for dealing with the symptoms as and when they occur. Unfortunately even on this front, the results are usually dismal, and that is what sends patients towards alternative treatment modalities. To add to the problem, immunosuppressant drugs like cyclosporine, alefacept and efalizumab as well as corticosteroids and oral retinoids are all known to have serious side effects. Even if you were to contend with these side effects, the fact is that none of them are universally effective. In contrast and as discussed above, simple natural remedies like aloe vera and curcumin as well as alternative therapies like lifestyle and dietary changes offer conspicuously positive results against psoriasis, without the dangerous side effects of conventional drugs. Another plus for natural treatments, such as aromatherapy and the topical use of essential oils, is that they also help to control the psychological effects of psoriasis. Several essential oils could be useful when it comes to the treatment of psoriasis. Some are known for their detoxifying effects, while there are others that are known for their moisturizing ability. In addition, they have the remarkable ability of minimizing stress, and their antibacterial qualities support the defense mechanisms of the body. 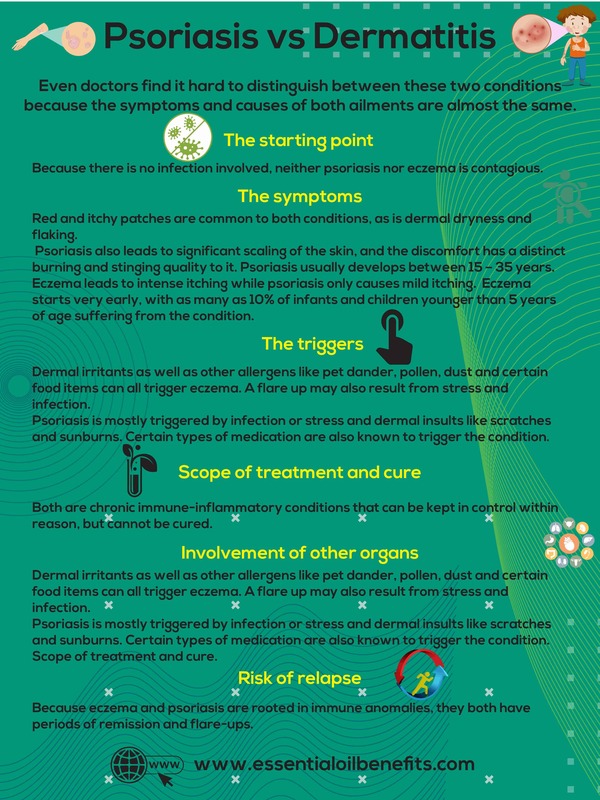 The two images below show 15 facts about psoriasis. 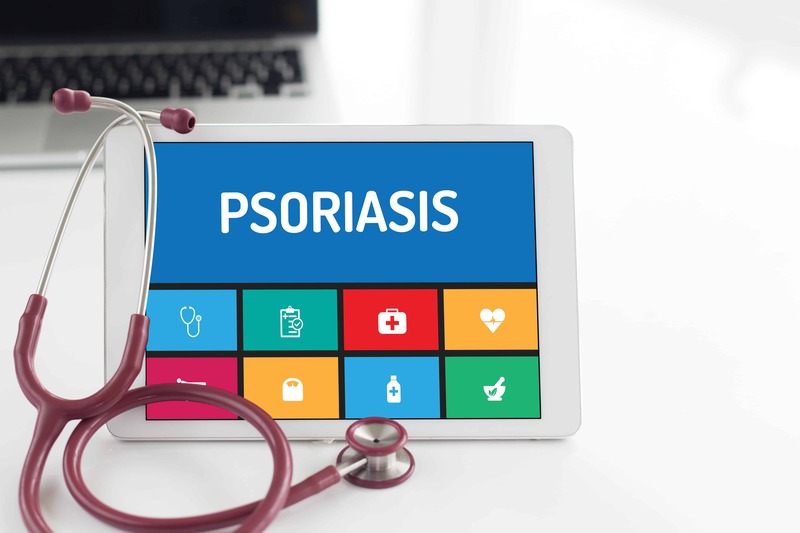 The medical community still has not reached a consensus on whether psoriasis is an autoimmune disorder or a chronic skin condition. However, everybody agrees on the fact that T-cells or the body’s defenders do have a central role in the problem. In psoriasis, these T-cells attack and kill the skin cells, as if they were external threats. The body boosts the production of dermal cells by almost 10 times, to make up for the loss as if it were trying to heal a wound. Together, these abnormalities lead to inflamed patches that are covered by an accumulation of dead skin cells. Recent research has revealed that the hyper-immune response may be triggered by an abnormal response to normal dermal bacteria. These critters do not elicit such a response in people who don’t suffer from psoriasis. Even doctors find it hard sometimes to distinguish between these two conditions. The problem is that not only the symptoms but also the causes of both ailments are almost the same. Both psoriasis and eczema involve abnormal behavior of the immune system. Although the jury is still out on whether psoriasis can be considered an autoimmune condition, what we do know is that inflammation is involved in both conditions and this comes courtesy of a hyper immune response to normally innocuous substances or microorganism. Because there is no infection involved, neither psoriasis nor eczema is contagious. Red and itchy patches are common to both conditions, as is dermal dryness and flaking. But, psoriasis also leads to significant scaling of the skin, and the discomfort has a distinct burning and stinging quality to it. Eczema leads to intense itching while psoriasis only causes mild itching. Eczema starts very early, with as many as 10% of infants and children younger than 5 years of age suffering from the condition. 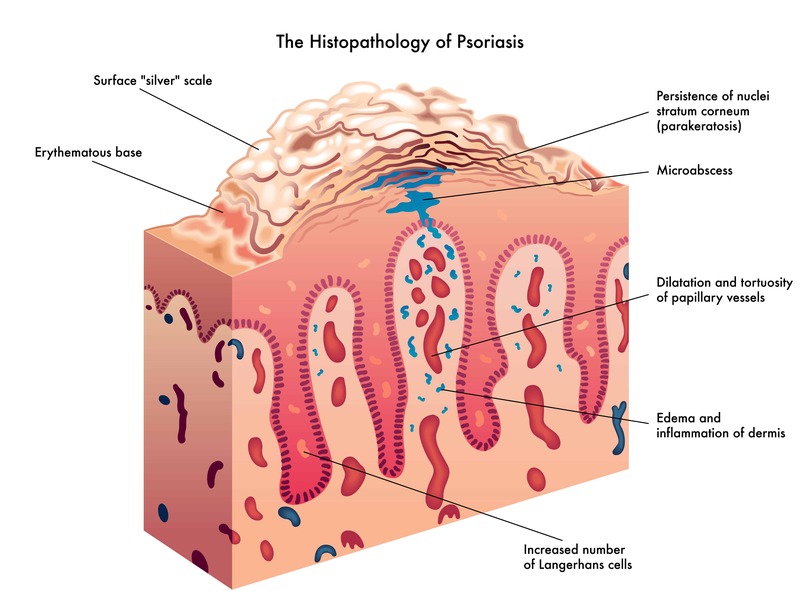 In contrast, psoriasis develops later, usually between 15 – 35 years. Dermal irritants as well as other allergens like pet dander, pollen, dust and certain food items can all trigger eczema. A flare up may also result from stress and infection. Psoriasis is mostly triggered by infection or stress and dermal insults like scratches and sunburns. Certain types of medication are also known to trigger the condition. Both are chronic immune-inflammatory conditions that can be kept in control within reason, but cannot be cured. In 10-30% cases, psoriasis patients also suffer from psoriatic arthritis. Moreover, the condition also affects the nails. These issues are not encountered by eczema patients. Because eczema and psoriasis are rooted in immune anomalies, they both have periods of remission and flare-ups. 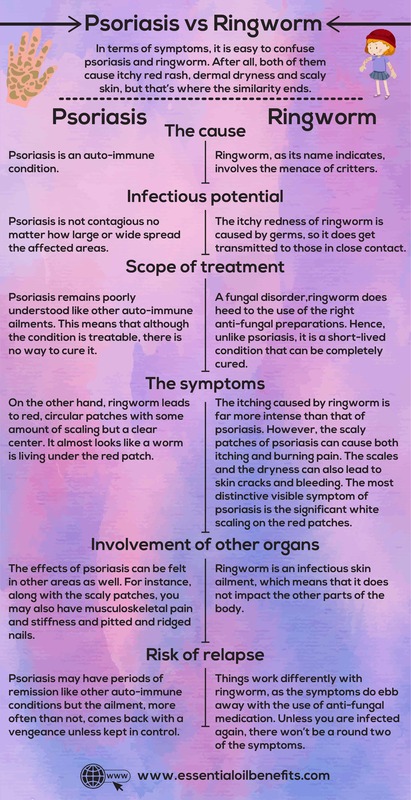 In terms of overt symptoms, yes, it is easy to confuse psoriasis and ringworm. After all, both of them cause itchy red rash, dermal dryness and scaly skin, but that’s where the similarity ends. I have already told you that psoriasis is an auto-immune condition. In contrast, ringworm, as its name indicates, involves the menace of critters. Even though the patchiness of psoriasis is hardly a sight to behold, the ailment is not contagious no matter how large or wide spread the affected areas. But the itchy redness of ringworm is caused by germs, so it does get transmitted to those in close contact. A fungal disorder, ringworm does heed to the use of the right anti-fungal preparations. Hence, unlike psoriasis, it is a short lived condition that can be completely cured. Psoriasis remains poorly understood like other auto-immune ailments. This means that although the condition is treatable, there is no way to cure it. The itching caused by ringworm is far more intense than that of psoriasis. However, the scaly patches of psoriasis can cause both itching and burning pain. The scales and the dryness can also lead to skin cracks and bleeding. The most distinctive visible symptom of psoriasis is the significant white scaling on the red patches. On the other hand, ringworm leads to red, circular patches with some amount of scaling but a clear center. It almost looks like a worm is living under the red patch. Ringworm is an infectious skin ailment, which means that it does not impact the other parts of the body. As opposed to this, the effects of psoriasis can be felt in other areas as well. For instance, along with the scaly patches, you may also have musculoskeletal pain and stiffness and pitted and ridged nails. Psoriasis may have periods of remission like other auto-immune conditions but the ailment, more often than not, comes back with a vengeance unless kept in control. Things work differently with ringworm, as the symptoms do ebb away with the use of anti-fungal medication. Unless you are infected again, there won’t be a round two of the symptoms. How Can Essential Oils Help With Psoriasis? Cyclooxygenase or COX are enzymes that play a vital role in the formation of compounds that cause pain and inflammation. Most NSAIDs are inhibitors of COX-2, an enzyme from the family that is central to the body’s inflammatory response. So, NSAIDs work by blocking COX-2, which eases the pain and the inflammation. 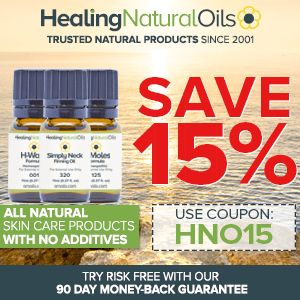 Many essential oils are potent COX-2 inhibitors that work just as well and even better than OTC painkillers, with the difference that unlike these drugs, essential oils have no side effects. Tumor necrosis factor-alpha is an inflammatory protein that triggers and continues the inflammatory process in the body. Think of this cytokine as the army of your immune system that is responsible for every symptom of inflammation. Those who suffer from psoriasis have very high levels of TNF. Modern medicine tries to remedy the situation with immune-modulators. But, when you remove the defenders from the system, your body is left vulnerable to critter attacks. With essential oils, it is possible to inhibit TNF at the site of application, without causing a systemic effect that leaves you open to infections. Also, these oils offer almost immediate reprieve from the discomfort of psoriasis. Be it pain, itching, stinging or burning, essential oils offer lightning fast relief, which equates to a lower risk of ending up with scratch wounds and infections. How To Use Essential Oils For Psoriasis? A bath to soothe inflamed and itchy areas of the body. A scrub made by mixing herbal powders with essential oils that sloughs off the dead cells gently. A moisturizer to lower the risk of flare-ups. As a spot treatment to control the inflammation and discomfort. As a shampoo to keep the scalp free of inflammation and infection. In the diffuser to get rid of stress that may be the cause or the result of psoriasis. I admit that while essential oils do not cure the condition, they do help immensely in controlling flare-ups as well as the discomfort that the ailment brings along. In a bit, we will talk about the best essential oils for the job. But, before we get to that part, I want to discuss another important aspect of alternative or for that matter any kind of treatment. Particularly, when using essential oils, it is imperative to know what oils to use for a particular condition and how much of these oils you ought to be using. Do not make the grave mistake of underestimating the potency of these oils. Remember, that a more ounce of these extracts is the core concentrate of several kilograms of plant material. So, it goes without saying that if you are not careful about dilution and using the right kind of oils, trouble awaits! That said, not every oil works for everybody. For instance, while penicillin is a powerful and effective antibiotic, there are those who are allergic to it. Ditto for essential oils! Personally, I like to use Amoil’s H-Psoriasis Formula if I don’t have time to make my own blend of essential oil. Click Here To Read My Review On Amoils H-Psoriasis! The L’orpur Problem Skin Relief Natural Cream is designed to treat and prevent recurrence of difficult skin conditions including psoriasis. It has unmatched anti-bacterial and healing properties and provides instant and long-lasting relief for severely dry, cracked, itchy and irritated skin. Without further ado, let’s discuss not just the benefits of the best essential oils for psoriasis but also the possible side effects, if any. This oils works in three ways to tame the wrath of psoriasis. For starters, its healing nature offers quick reprieve from the incessant itching caused by the condition. Moreover, the carvacrol and thymol in the extract are potent germ killers and anti-inflammatory agents. So, thyme essential oil limits the effects of the immune response that eventually leads to the build-up of dead cells. It stops the itching that the plaque causes, and finally, it prevents the risk of an infection if the itching has led to open wounds. Although it’s a skin friendly oil, it is crucial to restrict its use to 1.5% (about 3-4 drops in 30 ml) to limit the possibility of an allergic reaction. Thyme is a member of the Lamiaceae botanical family, which includes lavender, rosemary and oregano. If you are allergic to any of these herbs/plants, thyme essential oil may cause an allergic reaction. Although Tisserand et al have suggested that this oil is safe for use during pregnancy and I humbly concur with them, because research in the matter is lacking, I’d still suggest that you refrain from using it when pregnant or breastfeeding. A rich source of geraniol, which is a powerful anti-inflammatory compound and citronellol, which helps to keep skin infections at bay, geranium essential oil fights psoriasis on several fronts. Because it calms the mind and the body, the extract not only helps against the physical discomfort of psoriasis but also the mental anguish and stress that the condition causes. Geranium oil is also an immune-regulator, so it helps to tone down the hyper-immune response that causes flare-ups. Generally, the oil is considered very safe and gentle for both topical application and diffusion. But, the geraniol in it has been deemed a skin irritant. So in hyper sensitive individuals, it may lead to dermal irritation and contact dermatitis. Hence, a patch test is certainly recommended. Orally administered geranium oil can interfere with anti-diabetic medication. But then, this oil is not meant for oral use. 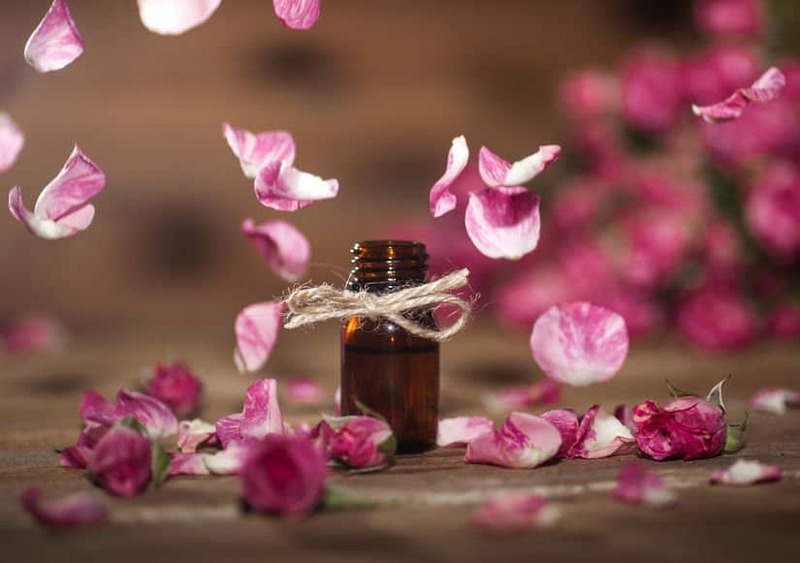 I like to think of rose essential oil as droplets of happiness and joy in a bottle and never once has it let my views down. The enthralling fragrance of this extract is so penetratingly intense that it takes your mind away from the mental detriments of psoriasis. Gone will be the stress, anxiety and depression only to be replaced by a deep sense of calm. But, that is not all. The effects of this oil on the brain are not just limited to the emotions. The aroma compels the immune system and the skin to behave themselves. Applied topically, this oil exerts significant anti-inflammatory and anti-oxidant effects. Hence, it is often included in formulations meant to treat, heal and soothe the skin, and that is exactly what you need when battling psoriasis. Although the high price tag of this oil is a deterrent, I would not call it a side effect even on the wallet because the benefits of this extract justify its cost. That said, adulteration is a big concern when it comes to rose oil and one that often leads to adverse skin reactions. Also, I would recommend that you start slowly with it. The aroma is truly intense so a little goes a long way, and going overboard with it, will just have you reeking of roses and giving yourself and those around a headache. This oil has made it to my list owing to its pro-circulatory powers. A natural and highly effective cleansing and detox agent, juniper berry oil significantly amps up the flow of blood to the skin. When blood flow increases, it offers more nutrition to the skin cells, thus delaying their death and build up. Also, it helps in the faster removal of metabolic waste, which may contribute to the hyper-immune response that leads to the attack on the dermal cells. Having said that, juniper essential oil is an extraordinarily powerful astringent, which lends it the ability to close wounds faster and deal with acne and oily skin. But, this astringent effect does increase the chances of dermal dryness and sensitivity. So, if you have eczema along with psoriasis or exceptionally sensitive skin, juniper oil may not be right for you. Given that research is lacking in the matter, it would be best to avoid the use of this oil when pregnant or breastfeeding and on children. Aromatically, the oil is known to be invigorating, so avoid using it at night. If the ailment involves inflammation and stress, lavender will often be in the list of the top essential oils to use, and for good reasons. It has superlative anti-inflammatory properties and the potential to ease both the physical and mental issues caused by psoriasis. In addition, lavender oil also offers significant protection from infection causing pathogens. 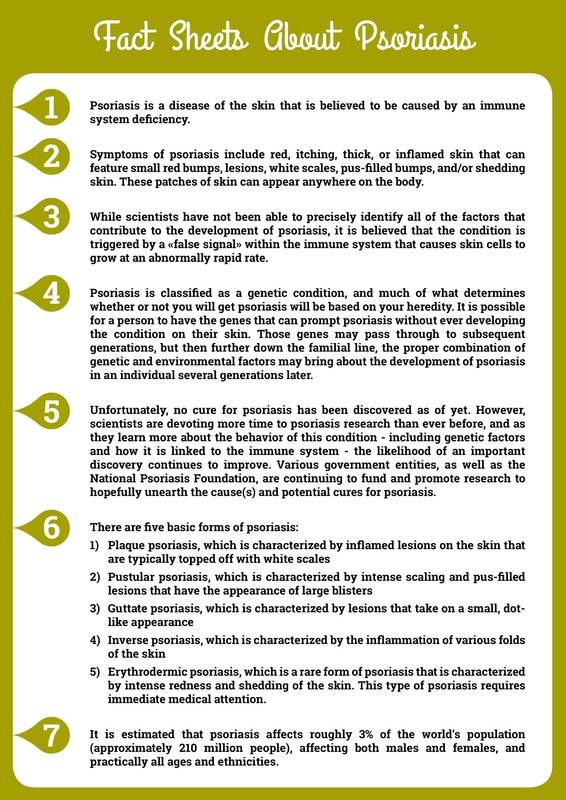 So, as far as psoriasis is concerned, this extract covers all the bases. It is safe and gentle to the point where many recommend using lavender undiluted (neat), although in most cases, I do not subscribe to this practice. It is also one of the few oils that can be used on children. However, as discussed above, the violet blooms come from a plant in the Lamiaceae family, so if you are allergic to its brethren (sage, oregano, rosemary, etc), there is a high risk of contact allergy. Because lavender oil affects the central nervous system (CNS), it would be best to consult with your doctor before using this extract in any form if you are currently using anti-anxiety medication or CNS depressant drugs. Since this is one of the most powerful anti-inflammatory and anti-oxidant substances in nature, it goes without saying that helichrysum oil can help immensely against the redness, itching and scaling of psoriasis. Additionally, the extract also helps to minimize the risk of infection in case there are open wounds and oozing scratches involved. 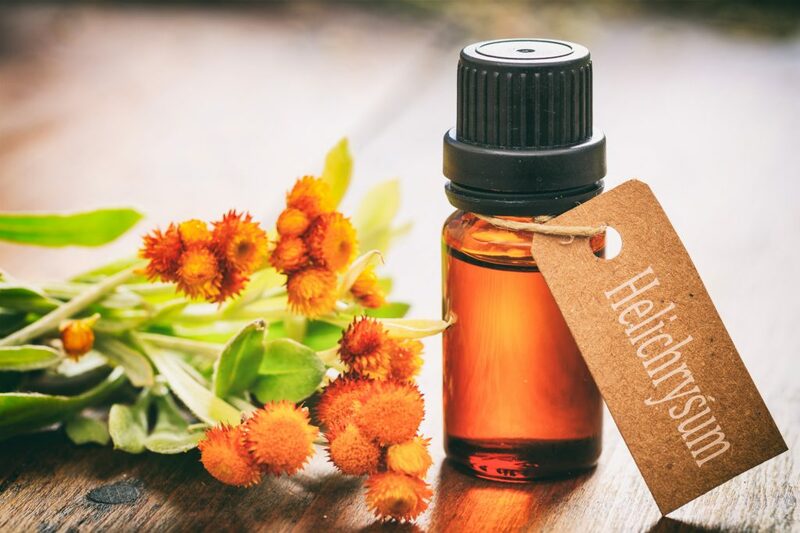 The best part of using helichrysum essential oil is that the calming effect of this extract is just as extensive on the mind as it is on the body. So, if the itching and the pain as well as the mental anguish of psoriasis is giving your sleepless nights, you can count on this oil to smooth things over on all fronts. The skin healing and soothing properties of sandalwood oil have been used for centuries in Ayurveda to deal with all types of inflammatory skin disorders. The ability of this oil to control the inflammatory cytokines helps to greatly curb the immune-response that eventually leads to the death of the dermal cells. Furthermore, alpha santalol, which is a major constituent of the oil, act in the same way NSAIDs do, but without the dangerous side effects of these drugs. So, sandalwood essential oil helps to limit not only the inflammation but also the discomfort caused by the inflammation. Moreover, the oil is an extremely effective emollient that improves the health of the dermal cells. And if that is not enough, you can always rely on sandalwood oil to calm emotions and dispel negativity and bring on sleep if it has been eluding you. Australian sandalwood oil used at 2% concentration poses minimal risk for skin irritation. However, the chances of dermal sensitivity are slightly higher with East Indian sandalwood (Santalum album). Hypersensitive individuals can experience contact dermatitis even at 1% concentration with East Indian sandalwood oil, possibly due to the greater chance of adulteration in this oil. 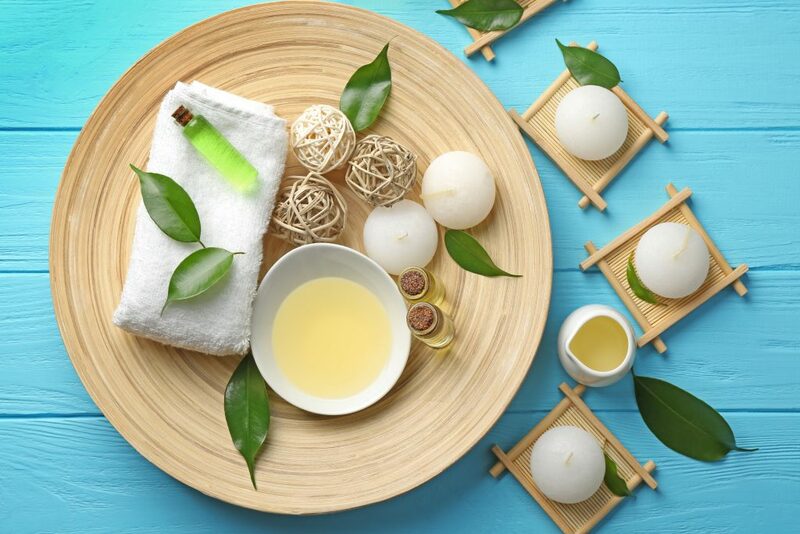 While the current popularity of tea tree oil is attributed to its antimicrobial properties, the extract has been used for centuries to control inflammation. Terpinen-4-ol, which makes up more than 30% of this extract, is a particularly potent anti-inflammatory agent. The oil is also a strong antimicrobial compound that can prevent secondary infections of psoriasis plaques. Although tea tree oil does not create a warming effect, the astringent nature of the extract is enough to limit the itching as well as the irritation. Tea tree oil rarely leads to dermal irritation if used at a concentration of 2%-5%. However, its astringent effect may cause some amount of dermal dryness. But, this can easily be countered by using the right carrier oil. I recently found a useful video showing how to use Tea Tree Oil to treat psoriasis. Some people argue that since eucalyptus oil is a counter irritant, it does not make sense to use it on skin that is already irritated. Well, for starters, the ability of this oil to block the pain impulse means that it substantially lowers the risk of swelling, redness and other inflammatory markers. Also, the heating effect of the oil is significant enough to dull even acute joint pain, so understandably, the itching induced by psoriasis does not stand a chance. Furthermore, 1,8 cineole, which is the predominant constituent of the oil, is a proven anti-inflammatory and anti-microbial agent. According to Tisserand et al, eucalyptus essential oil is “virtually non-allergenic”. Nonetheless, if you are allergic to other essential oils or suffer from dermatitis, keep the concentration of eucalyptus oil at 1%. Do not use this oil around babies and young children. Also, those who are suffering from estrogen-dependent cancer should not use this oil. Talk to your doctor before using eucalyptus oil if you are taking homeopathic medication. Another extract that is rich in 1,8 cineole, peppermint oil produces the exact opposite sensory effect to that of eucalyptus. The intense cooling sensation produced by this extract instantly relieves the itching and pain of psoriasis. Moreover, the oil soothes the skin, calms inflammation and softens the dry, scaly patches. Plus, it also brings antimicrobial effects to the equation. 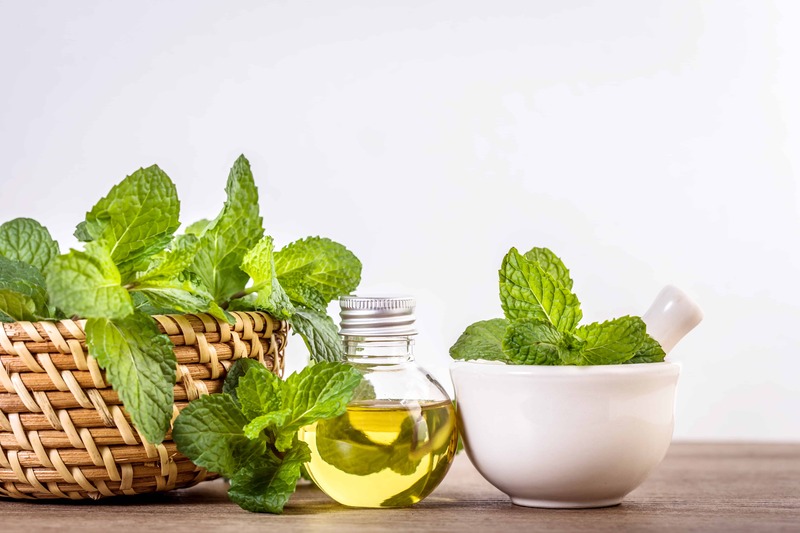 Because peppermint is also from the Lamiaceae family, there is the risk of contact dermatitis if you are allergic to the other plants from this family. Also, the profound cooling effect can be much to handle for sensitive skin. If you already suffer from contact dermatitis, it would be best to limit the use of this oil to 1%-2%. Do not use this oil on or around babies and young children. You should not use this oil in any form if you suffer from cardiac fibrillation. The antimicrobial and antioxidant properties of rosemary essential oil put this extract in a league of its own. 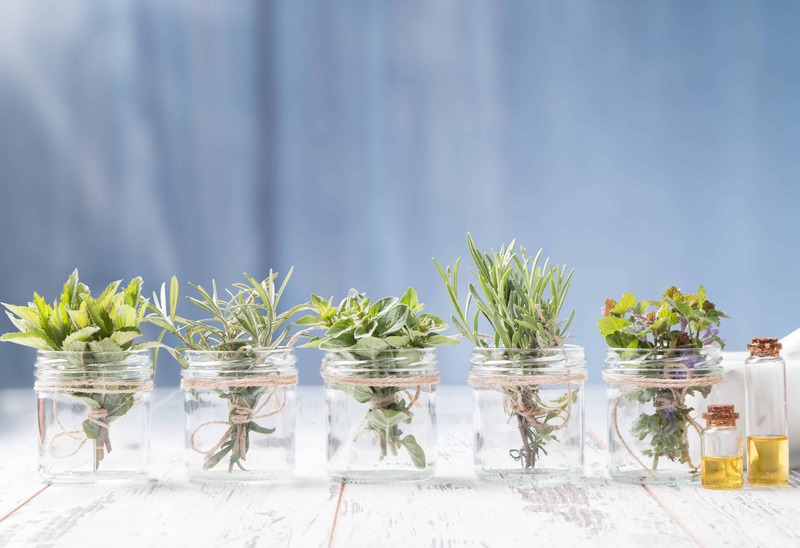 Whether it is strep or staph or even antibiotic resistant strains of these critters, rosemary oil can kick them all to the curb. Plus, it provides a gentler heating effect than eucalyptus and some of the spice oils. The warmth is just enough to soothe the itching and burning without creating trouble for sensitive skin. Additionally, like essential oils extracted from the other plants in the Lamiaceae family, rosemary oil is also a powerful anti-inflammatory agent. Furthermore, if your skin woes are making you feel down and out, this oil can perk you right up. In fact, the herbaceous, camphorous aroma of the oil does a tremendous job of keeping cortisol levels in check. So, stress stops being a precipitating factor for psoriasis flare-ups once you start using this oil. Although there is some indication that rosemary oil is contraindicated for those who suffer from high blood pressure, Tisserand et al do not agree with this view. If you suffer from dermatitis, do a patch test before using this oil and limit yourself to 1% concentration. This oil may seem like an unlikely choice, but that’s only till you take a closer look at its therapeutic and antibacterial benefits. The earthy aroma of this oil has a grounding effect on the body and the mind. So, you can count on it to deal with the stress and depression brought on by psoriasis as well as the inflammation, itching, skin dryness and stinging that leads to these emotional issues. Another plus is the ability of this extract to stave off infectious critters. Patchouli oil is a potent skin tonic that improves the health of the dermal cells. 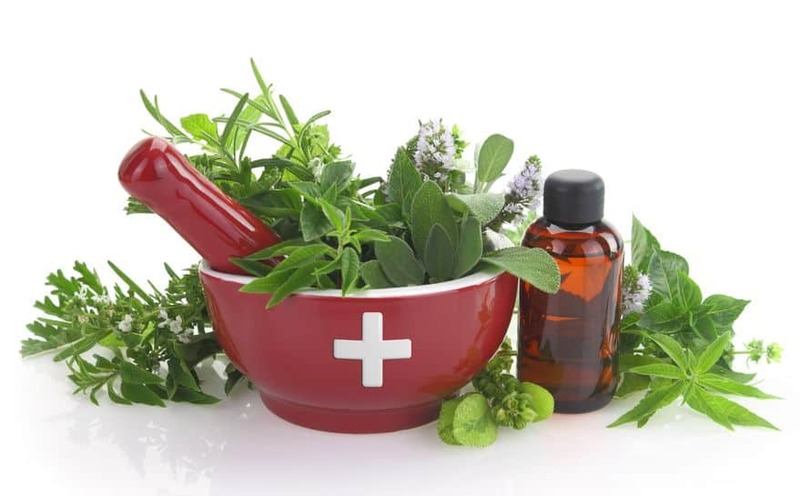 Adverse skin reactions are extremely rare when using patchouli oil at less than 5% concentration. If you are on anti-coagulant medication, talk to your doctor before using this oil. I bet you have been wondering how come chamomile essential oil has not made its way into this list. Well, so here it is! 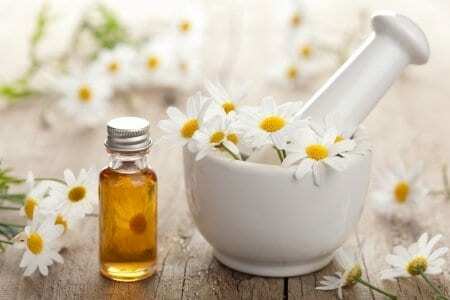 In terms of its anti-inflammatory properties, German chamomile is second only to helichrysum. But, it also has a lower price tag. That said, the striking blue oil delivers everything that you may have come to expect from a highly soothing natural ingredient. The anti-inflammatory and soothing effects of the oil become evident within the first few applications. Inflammation, redness, pain, itching, burning and the build-up of scales, you will experience a significant reduction in all these symptoms. Furthermore, the fresh, green aroma of the oil also puts the mind at ease by keeping cortisol levels in check and gently inducing sleep when it is needed the most. The risk of this gentle oil leading to an adverse skin reaction is extremely low but if you suffer from dermatitis, keep the dilution at 1%. When used on the skin, this citrus oil not only calms inflammation and irritation but also lends a helping hand to the other bioactive compounds to make it through the skin’s defensive barrier. An effective natural cleanser, the oil helps to purge the dermal layers of metabolic waste and aids in the faster removal of cellular debris from the surface of the skin. The uniquely complex citrus aroma of this oil is invigorating, uplifting and soothing all at once. So, whether psoriasis has left a dent in your confidence levels or has just made you generally unhappy and depressed, the sprightly scent of this oil can tackle all your wayward emotions. Bergamot oil has a high risk of phototoxicity unless you use a bergaptene free version of the oil. It has a relatively short shelf life of 9-12 months and there is a great possibility of adverse skin reaction if you use oxidized bergamot oil. This is another popular anti-inflammatory oil that can provide the TLC that psoriasis skin needs. In fact, this is one of the few natural ingredients that has clinical backing for its anti-inflammatory properties. The healing effects of this oil step in almost immediately and can be experienced in the form of a conspicuous reduction in both the swelling and redness of psoriasis affected parts. Moreover, the balsamic, earthy aroma of the extract helps to tackle negative emotions, stress and depression. 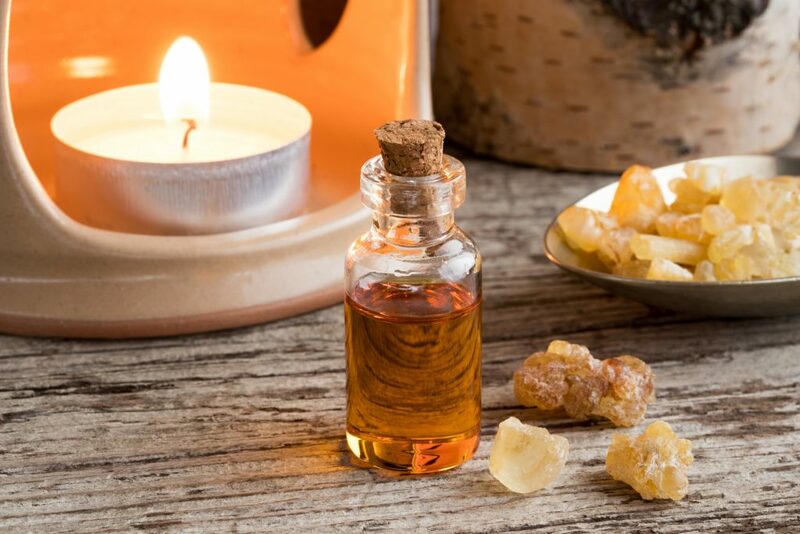 Frankincense oil seldom causes allergic reactions, but if you cannot tolerate other essential oils, limit the use of this oil to 2% and do a patch test. Some of the bioactives in this oil can react with blood thinners. So, talk to your doctor before using this oil if you are on such medication. This is among the handful of natural ingredients that have been tested as a possible treatment for psoriasis. Although the studies involved rodent subjects, the results were extremely positive. Plus, copaiba oil has a stellar history of use as a treatment for inflammatory conditions. Both facts considered, it would be safe to assume that this oil is capable of offering the same spectacular results when used on human skin afflicted by psoriasis. There is ample anecdotal evidence to suggest that the oil reduces inflammation, itchiness and above all the build-up of dead cells because it targets the immune response that is the core cause of the condition. Since the extract has a direct impact on the nerves, it stops the impulse of pain and itching from reaching the brain. Furthermore, it also helps to keep the redness, swelling and scaling in check because it inhibits the release and action of pro-inflammatory molecules. Copaiba oil is generally considered safe and is only known to cause adverse skin reactions when not diluted properly. At 2-3% dilution, it should cause no trouble. Having said that, always do a patch test if you suffer from dermatitis or have hypersensitive skin. Copaiba oil may pose a hindrance to the excretion of lithium from the body. 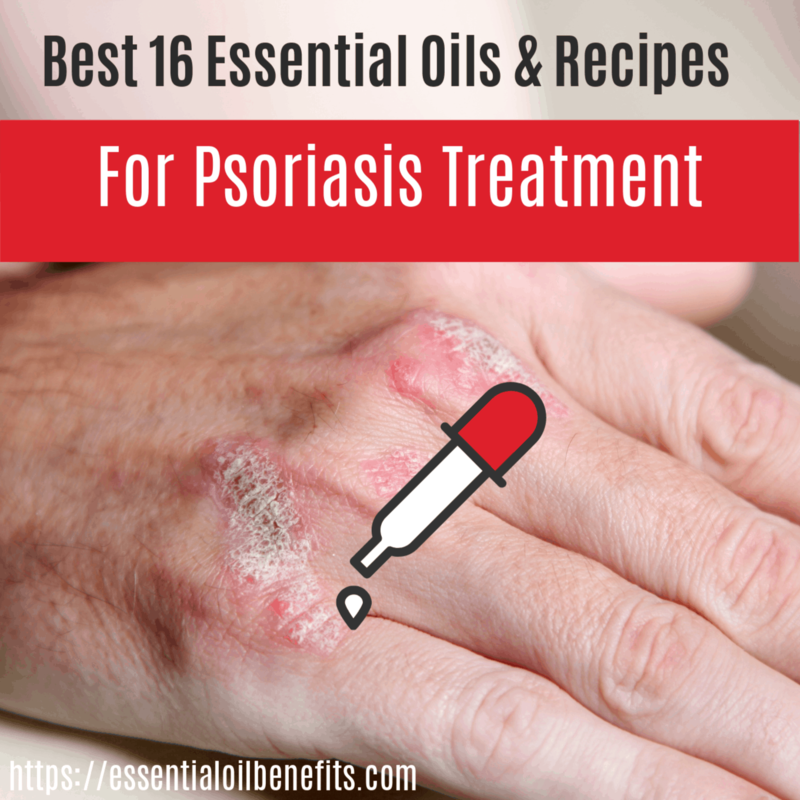 What Are The Best Essential Oil Recipes For Psoriasis? For those that are seeking relief from itching and burning of Psoriasis flare-ups, you need to try this alkalizing bath. 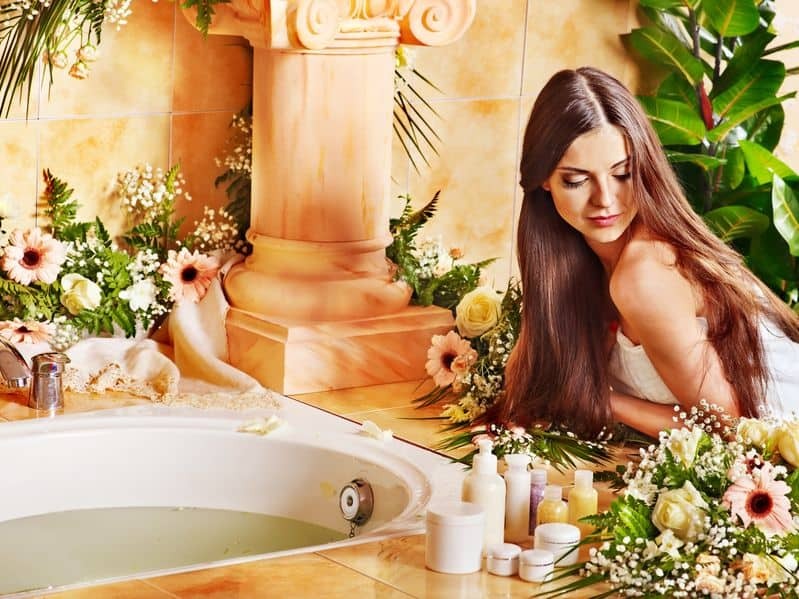 This bath can make your skin condition a little worse before it starts to improve – but this is often a good indication showing that the detoxification process of the body is now being stimulated. Place 1 cup oats, 1 cup baking soda and 1 cup cornflour within a pop sock and tie properly. Have a warm (not hot) water and add this pop sock along with 1 cup of apple cider vinegar- squeezing the sock well! Use this bath 5 times in a week to help your body soothe and heal itself. Mix 4 drops of Lavender, 4 drops of Bergamot, 2 drops German Chamomile, 1 teaspoon Virgin Cold Pressed Olive Oil, 1 teaspoon Jojoba Oil, 1 cup oats and 1/2 cup Dead Sea Salt. Place the mix in a pop sock and tie properly. Add the sock to the warm bath water and squeeze regularly to ensure that the salts dissolve and the Oat milk is released. Use this bath blend one or two times in a week to help moisturize and soothe your skin. Oils and salt present in the bath will likely prevent infection from happening if the skin is cracked. Use this gel after having a bath or shower on the lesions – or on places where lesions are likely to appear – always execute a skin patch test first to ensure the suitability of the Oil you are using. Take 100ml Seaweed and Aloe Vera Gel or a moisturizing cream base and add 10ml Jojoba Oil, 10ml Vitamin E Oil, 10ml Avocado Oil, 4 ml Tea Tree, 4 ml Patchouli, 10 ml Lavender, 10 ml Bergamot and 3 drops of German Chamomile. Stir well and keep inside an airtight jar. 3 ounces or 6 tbsp carrier Oil (like Avocado Oil, Sweet Almond Oil, Pumpkin Seed Oil, Coconut Oil, Kukui Nut Oil, Rosehip Seed Oil etc.) I have found that a blend of Kukui, Avocado, and Almond is the most popular. 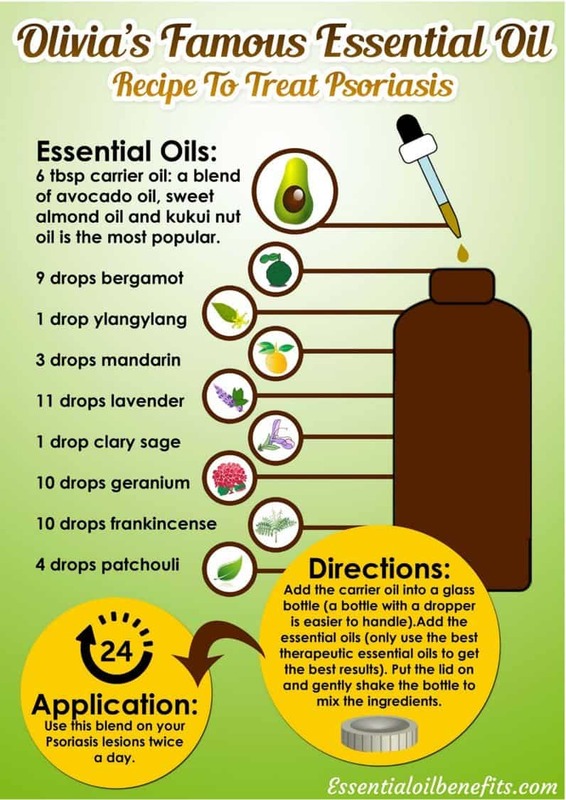 Add the carrier Oil into a glass bottle (a bottle with a dropper is easier to handle). Add the Essential Oils. Take note, the grade of Essential Oil you use will greatly affect the strength of the therapy. Use the best kind of Oils available. Put the lid on and gently shake the bottle to mix the ingredients. Use this blend on your Psoriasis lesions twice in a day. If you are suffering from psoriasis, soaking in water can make it worse. In such cases, Magnesium baths and other kinds of detoxification baths will be helpful in healing the skin. I generally add a cupful of magnesium flakes or epsom salts along with a little Himalayan salt to the baths of my children. Whenever I find time, I never tend to lose the opportunity to take a relaxing bath in this mix. When I am not able to spend time in bath, topical application of magnesium Oil helps. Amazingly, I am able to notice the results from trans-dermal magnesium baths far more quickly compared to taking magnesium internally. The effect of this recipe is heightened when used with warm water. If the cheaper alternative offers the same efficiency and effects, why buy the pricey Essential Oils. The Oil used must be able to address the needs of different kinds of skins. Essential Oils with larger range of properties work best for all kinds of bodies and environments. Some Oils are readily available while some are not. The Essential Oil you are using must be easily available in the market so you don’t have to search for it and delay your treatment. Essential Oils that are easy to apply are more practical for everyday use. The treatment approach is all natural with no side effects, unlike using medicines prescribed by doctors. Most essential oils are meant for every kind of skin. Therefore, you can easily find an essential oil that fits your skin type. Some essential oils can be dangerous if applied neat (undiluted). You also need to exercise caution if you have a pre-existing condition. Essential oils can easily be oxidized and rendered ineffective if it is exposed to open air and sunlight for long period of time. Almost all of coconut oil is saturated fatty acids, with most of it being lauric acid. Now, there is a raging debate about how healthy or dangerous the consumption of coconut oil really is. But the one thing that both sides agree on is the ability of this oil to repair and restore the skin’s lipid barrier. Add to this the fact that lauric acid also happens to be a powerful anti-inflammatory agent, and it is easy to see why many folks vouch by the efficacy of even coconut oil on its own in treating psoriasis. Apart from this triglyceride, coconut oil also contains other saturated fatty acids like stearic acid, palmitic acid and myristic acid. Together the trio boasts of superlative emollient properties. They lubricate the skin and keep it soft and supple. In addition, capric and caprylic acids lend the oil its occlusive abilities that help to block the loss of moisture from the skin cells, thus preventing dermal dryness and dehydration. 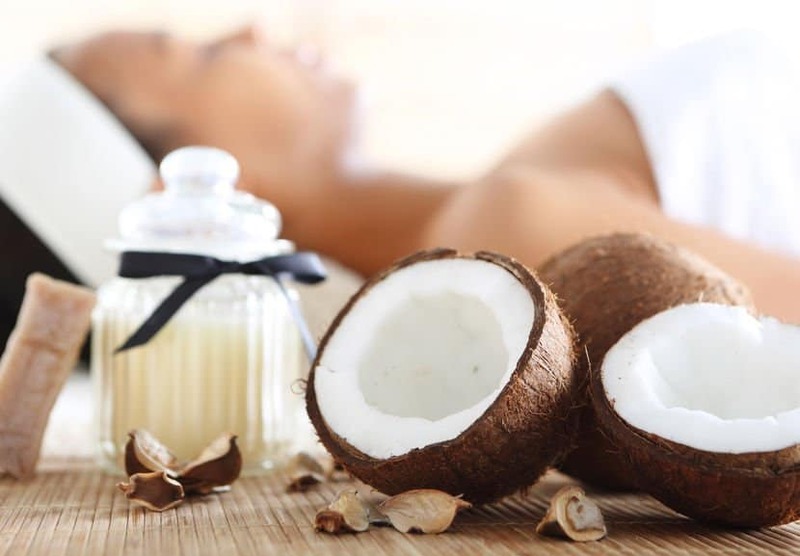 Coconut oil also contains a small amount of oleic acid, which gives it the ability to increase skin permeability. Additionally, the trace nutrients (vitamin E and iron) and sterols offer antioxidant and added anti-inflammatory benefits. Moreover, coconut oil is also a powerful antimicrobial agent and since there is an ever prevalent risk of skin infections when you have psoriasis, this oils does go a long way in improving skin health. Mix all the ingredients and store in an airtight steel/glass container in the refrigerator (not the freezer). The gels keeps for 7-10 days. To use, apply the chilled gel on the plaques and allow it to get to a semi-dry state. When your skin feels just a wee bit sticky, apply the oil blend below on top and allow the dual treatment to heal and soothe your skin overnight. Mix the oils together and store in a dark glass bottle. Use as directed above. The striking similarity of jojoba oil to sebum is possibly attributed to its unique lipid profile. The oil primarily contains 2 Omega 9 fatty acids; eicosenoic and erucic. These triglycerides along with oleic acid give jojoba oil its superlative ability to penetrate through the dermal layers. Because it closely resembles the chemistry of sebum and boasts of high quantities of wax esters, the oil not only works as a moisturizer but also doubles up as an occlusive agent. In fact, the occlusive effect comes without the oiliness and stickiness of petrolatum or other viscous oils. Mix the oils and store in a dark glass bottle. Use every morning 45-60 minutes before your shower. Apply generously all over your body, paying special attention to plaque patches and the major joints. Massage the blend gently into your skin, as you would a regular body oil/lotion. The combination of the oil blend and the gentle stretching that naturally occurs as you massage yourself helps to heal the skin and joint soreness. Remember to only use warm water for your bath and limit your shower time to 10- 15 minutes. Pat your skin dry after the shower and moisturize within 3 minutes. A rich source of vitamin E and an excellent emollient, almond oil offers protection, moisturization and healing. The soothing oil has long been an Ayurvedic staple for treating dermal dryness and inflammatory skin conditions. Almond oil is not particularly viscous; yet it is a superlative occlusive agent that not only protects the skin from external allergens but also prevents transepidermal loss of water, which is known to exacerbate dermal dryness. Now, a lot of people would argue that the high oleic content of almond oil, which stands at a whopping 55% plus, gives this oil an amazing ability to get through the dermal barriers but the disruption it causes in the stratum corneum may prove counterproductive when dealing with psoriasis. Actually, the high content of oleic acid is precisely the reason why this oil works for psoriasis. Even at a concentration of 10%, this triglyceride lowers the number of the Langerhans cells substantially. These are dendritic cells that pass the message of attack to the T-cells that sit in the lymph nodes. These T-cells, in turn, trigger the inflammatory immune response. So in simple words, these cells are the messengers of trouble. Get them out of the equation and the trouble does not start or at least can be controlled. Since oleic acid can bring down the number of these cells by as much as 60%, it is understandable why for centuries, this humble oil has been the go-to treatment for all types of inflammatory skin disorders. So, how can you use an oil with fantabulous anti-inflammatory properties that also happens to enhance skin permeability? Why, in a gentle yet highly effective scrub of course! Mix the ingredients to make a syrupy/lotion-like paste. You won’t need more than 1 exfoliation session per week. So, start by prepping your skin the night before by generously moisturizing the plaques. You can even use the grape seed oil recipe below. The next day in the morning, make the chickpea lotion and rub it all over the plaques. Work in an opposite direction to the scales or simply move in an upward direction. You don’t have to apply any downwards pressure as the natural adhesion provided by the chickpea flour and the slight abrasiveness of the other powders is enough to gently slough off the dead cells. Whatever you do, don’t scrub your skin with the mixture; that is not how this is supposed to work. Think of it more like a gentle and healing massage. You will have to spend no more than 3-4 minutes in each area. You will know it is time to stop when you feel the mixture getting thicker under your ministrations. That’s the time you take this to the bathroom and wash off the paste with warm/room temperature water. Pat dry your skin and moisturize immediately. There is nothing extraordinary about the lipid profile of grape seed oil. It’s almost 70% Omega 6 fatty acids (linoleic) and less than 20% Omega 3 fatty acids (oleic). If you were to only consider the benefits of its triglyceride content, you get a soothing emollient that also has the ability to transport other active ingredients to the deeper dermal layers. In terms of viscosity, this is a light oil that does not leave behind a sticky film, which explains its extensive use in cosmetic formulations. But, what makes it a good fit for psoriasis skin? To answer that question, I will have to draw your attention to the minor constituents of this oil. 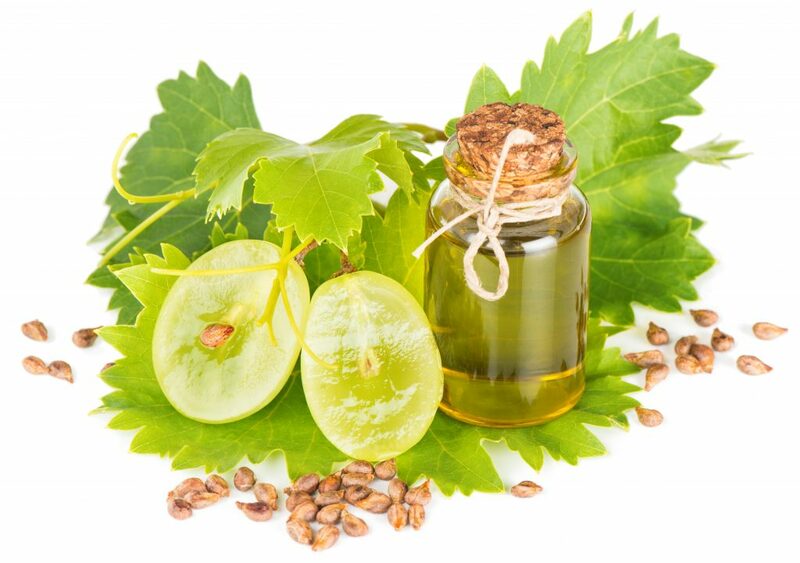 Grape seed oil is exceptionally rich in phenolic compounds such as trans-resveratrol, catechins, flavanoids, carotenoids, epicatechins, stilbenes, procyanidin and others. These are involved in several biological processes that control oxidative damage and inflammation. Moreover, it is a rich source of tocotrienols, think of these as vitamin E with super powers. Hence, you get more in terms of both anti-oxidant and anti-inflammatory effects. 8 drops wrightia tinctoria oil (not easily available but very effective and backed by anecdotal evidence and the experience of Ayurveda practitioners. In fact, this is said to be a miracle worker for psoriatic skin issues). If you cannot find the essential oil, look for dried herb/leaf powder. Infuse coconut oil with the dried herb. Mix the oils and store in an amber/blue glass bottle. To use, start by applying generously on affected areas. Next, soak gauze bandage in the oil. Wring gently to remove excess oil. Wrap around the plaque and cover with a thicker bandage (cotton is better than gauze for this layer) or plastic wrap. Keep both bandages/coverings on your skin for at least 3-4 hours, preferably overnight. Other carrier oils that you can use include Borage seed, Tamanu, Evening Primrose and Andiroba. Borage seed oil contains considerable amounts of Gamma Linoleic Acid. It can rejeuvenate the facial skin, and help to control Psoriasis. Tamanu oil is a rich and soothing moisturizer. Evening Primrose oil contains a high proportion of Gamma Linoleic Acid(GLA) and works similar to Borage Oil. The stearic acid in Andiroba checks the overgrowth of skin cells. The linoleic acid present in it restores the regular life cycle and stops uncontrolled expansion of skin cells. A bit of sunlight can do a whole lot of good for psoriasis stricken skin although experts are not sure why and how it helps. But, don’t forget to slather on the sunscreen when spending time outdoors. The last thing you want to do is add to the dermal inflammation with UV damage or even a sunburn. Ideally, opt for a product that contains mechanical instead of chemical sun blocks. Those with zinc oxide are the best since they offer protection from both UVA and UVB rays. Because inflammation is at the root of the condition, anti-inflammatory herbs and supplements can help a lot in controlling psoriasis. Turmeric is considered the gold standard when it comes to inflammation control. A combination of curcumin (the bioactive in turmeric) and piperine is considered to be particularly effective against immune-inflammatory disorders. Fish oil, shark cartilage, vitamin D, milk thistle, probiotics and evening primrose oil can also work against the ailment. For those who suffer from psoriasis, no other factor/trigger can be half as detrimental as stress. In fact, stress is what keeps the vicious cycle of psoriasis going by triggering it and fuelling it. So, you have to do whatever it takes to control this factor. Yoga, meditation, journaling, tai chi, massages and forest bathing can all help. But most of all, you need to be in control of your sleep. A sleep deprived body will always have more cortisol than what’s good for it. So, don’t scrimp on your 8 hours of sleep, no matter what. Certain foods, fragrances and medication are known to trigger psoriasis flare-ups. Avoid products that contain these triggers. Also be mindful of the fact that psoriasis makes you more vulnerable to skin infections, which in turn can lead to more intense flare-ups. So, don’t take personal hygiene lightly. Whether it is smoking or excessive alcohol consumption or even your fondness for sugary treats, anything that increases the level of toxins and inflammation in your body is bound to worsen your psoriasis. So, if you want to get rid of this ailment, start by getting rid of your vices. 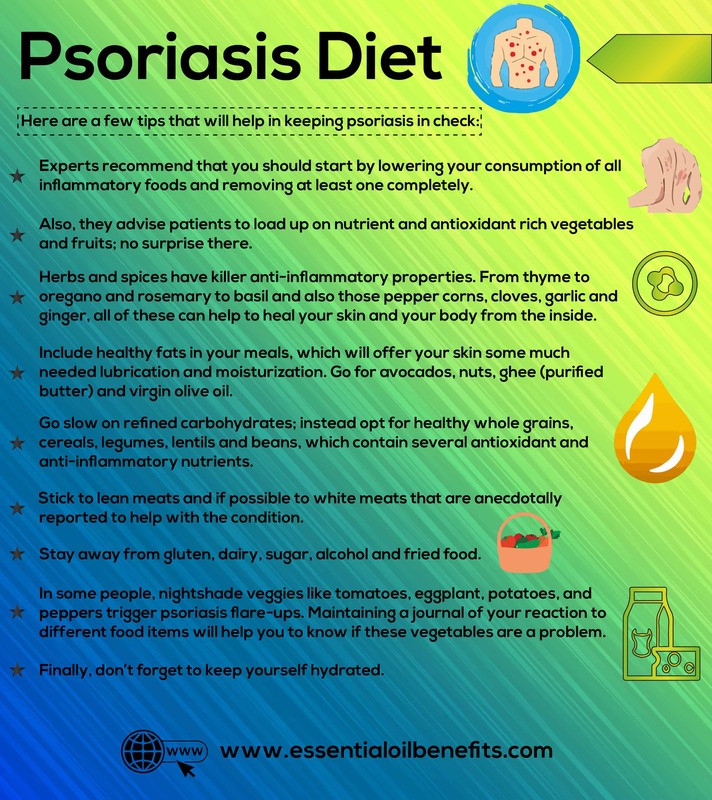 What Is The Best Diet For Psoriasis? At the outset, I want to clarify that there is only one clinical study that backs the efficacy of a suitable diet in keeping psoriasis in check. The findings of the study were published online in JAMA Dermatology in July, 2018. The study involved nearly 3600 psoriasis patients, and researchers found that patients who judiciously adhered to the Mediterranean diet, which is rich in fruits, vegetables and monounsaturated fats (virgin olive oil), had less severe symptoms of psoriasis. But the Mediterranean Diet is not the only dietary system that helps psoriasis patients. Many have reported similar results while on paleo, gluten-free and vegan diets. Although nobody knows as yet how food choices impact the ailment, what we know for a fact is that some foods do cause inflammation and that psoriasis is an inflammatory disease. So, it is easy to connect the dots. Furthermore, a study about the triggers of psoriasis threw up two culprits: alcohol and sugar. Both are known to cause widespread inflammation in the body, with alcohol also to be blamed for severe dehydration. These findings have added weight to the assumption that foods do indeed influence the severity of psoriasis. A lot of doctors believe that there may not be a direct connection between food and psoriasis but there may be a link between obesity and the ailment. Because the diets mentioned above inevitably lead to weight loss, they also help with psoriasis. I say, whatever the link; it is certainly worth a shot because psoriasis patients are also at a higher risk of suffering from cardiovascular ailments, including stroke and heart attack. Even if you are not a big fan of following any one type of diet, experts recommend that you should start by lowering your consumption of all inflammatory foods and removing at least one completely. Also, they advise patients to load up on nutrient and antioxidant rich vegetables and fruits; no surprise there. Don’t shy away from flavors. All those herbs and spices have killer anti-inflammatory properties. From thyme to oregano and rosemary to basil and also those pepper corns, cloves, garlic and ginger, all of these can help to heal your skin and your body from the inside. Include healthy fats in your meals, which will offer your skin some much needed lubrication and moisturization. Go for avocados, nuts, ghee (purified butter) and virgin olive oil. Go slow on refined carbohydrates; instead opt for healthy whole grains, cereals, legumes, lentils and beans, which contain several antioxidant and anti-inflammatory nutrients. Stick to lean meats and if possible to white meats that are anecdotally reported to help with the condition. Stay away from gluten, dairy, sugar, alcohol and fried food. In some people, nightshade veggies like tomatoes, eggplant, potatoes, and peppers trigger psoriasis flare-ups. Maintaining a journal of your reaction to different food items will help you to know if these vegetables are a problem. Finally, don’t forget to keep yourself hydrated. After I started making my own Essential Oil blends, I noticed that my skin loved these blends and it looked so much better. If you find that the blend you have prepared is too strong for your skin, add a little more carrier oil to reduce the strength. This information is most useful for teenagers that are known for their heavy handedness. Their skin is extra sensitive due to hormonal changes happening in their bodies. One of the benefits of making your own essential oil blends is definitely the cost saving that comes along. However, the most important benefit is the speedy improvement in your condition. What Are The Best Essential Oils And Recipes For Skin Cancer? I used to get psoriasis on my neck for about a year. I spoke with many doctors, who gave me many different medications. They barely worked, and the psoriasis came back. The medications also made me sick. My last doctor recommended that I apply essential oils and the Made from Earth Rosehip Serum on my neck area, because its soothing, and it worked! I used it for about 2 weeks, and the psoriasis on my neck was completely gone and has not come back for 3 months (since I have been using this product). I also use it on my arm area and it took about 3 weeks for the psoriasis to totally go away. I now use it as my daily moisturizer, and I am psoriasis free. GOOD LUCK TO YOU AS WELL! Thank you Paula! I am going to try this right away. I have pustular psoriasis on both of my feet and it’s so uncomfortable!! A friend of mine has very severe psoriasis and regularly has open wounds from scratching when itchy. and I am interested in recommending recipe 4. However we live in Australia so regularly exposed to sun. I saw in another posted you recommended using cypress oil instead of bergamot and tea tree oil instead of mandarin oil. Unfortunately he seemed to have a bit of irritation with tea tree oil. Can you recommend another oil to replace or should I just omit using mandarin oil in this recipe? You can use a few drops of thyme or rosemary essential oil instead. Hi there! Thank you so much for doing what you do and for sharing these recipes. Im using another solution for this “dandruff” issue. Hi, I’ve been using my own home-made tallow on psoriasis, and this has been the most effective moisturising solution I have found. A few months ago, I sprinkled a few drops of lavender oil (cheap and probably fake/chemical) onto a bar of tallow. After just one use, I had a widespread allergic reaction for which I had to seek hospital treatment. Since then, I’ve been using my tallow neat, but I’m keen to scent it so I don’t smell like a roast dinner (my husband’s words). I like sweet scents, especially vanilla and jasmine, but not sure they would help with psoriasis. Maybe a mix would be better? Could I add these (organic and pure cosmetic grade, this time) directly to some melted tallow? Would that suffice as a carrier? How many drops per 100ml of melted tallow? Your advice would make my day! If tallow works for you, you can add 15 drops geranium, 12 drops frankincense, 8 drops tea tree and 5 drops lavender essential oil to 100ml of tallow. The tallow which would act as the carrier oil. Of course, go for organic essential oils to avoid a repeat of the previous issue. In your recipe 4 you say to use aloe vera and seaweed gel, which I have not been able to find. Or use a moisturizing cream base. Do you have a good recipe for a moisturizing cream base or a source for aloe vera and seaweed gel? Thank you so much for your wonderful recipes. No worries, you’re welcome. You can use something similar to the one below as moisturizing base cream. We live in Singapore, where the weather is mostly hot and humid. I noticed in your comments section, you mentioned that we shouldn’t be in the sun for long hours after we use bergamot. May i know what recipe to use for my husband? He has severe psoriasis – he has psoriasis on every single part of his body and face. You can use any of the recipes, however, if you know you are going to be in the sun after application of the essential oil blend, you should avoid adding the citrus essential oils (bergamot, lemon, orange, mandarin, etc.). Substitute with myrrh, thyme or rosemary. Use crocodile oil. Singapore has wonderful pure Crocodile oil. Try it! I have a 6 year old son and half a year ago we spotted some signs of psoriasis on his inner arms, lower belly and inner legs- diagnosis confirmed by the doctor. Noone else in my or husband’s family has ever had psoriasis, so all come as a shock to us. The doctor immediately prescribed absolutely chemical topical creams, which I used couple of rounds on my son with big pain in my heart. Can you please advise if recipe 4 can be used on a 6 year old or if I should substitute certain essential oils? Very many thanks in advance! Sure, recipe 4 can be used on your son, please halve all the quantities of essential oils and drop the frankincense to 2 drops only, but keep the carrier oils the same (i.e. 6 tsp). That provides a greater dilution and also do a skin test patch of the blend before application. Please ensure you son does not go out in the sun for 3 hours after application due to the citrus oils in the blend. Thank you for your swift reply! And thank you so much for the great information you are sharing! I am planning on trying to conceive soon. I am hoping that you can help me with a formula that would be safe for preconception through pregnancy. Thank you so much! I assume you are referring about a safe recipe for psoriasis, please confirm. You can use cypress instead of bergamot and instead of mandarin, you can use tea tree. Most of the citrus oils (bergamot, mandarin, orange, etc.) may cause photosensitivity. I have tried quite a few of the above methods. I alternated bath Recipes 2 and 5, I also made Recipe 3. Within a month of diligent use, my psoriasis had cleared by about 70%. It was quite time-consuming but i was almost painfree by then. Due to my work and business commitments, I had to take a break with the treatment. I then bought H-Psoriasis and I am now close to 100% clear after using it for another 3 weeks. You need to be patient and dont expect results in 1 day or 1 week. Craig, I very rarely comment, but I’ll do it this time. I have some good and bad news. Tried Recipe 1 and 2 for a period of 2 weeks and they were not very effective in my case. My skin would be less inflamed and the swelling would reduce significantly immediately after the bath. That did not cure the psoriasis itself. A day later or even a few hours later, my skin would start to dry up and the red rash will appear and the whitish flaky crush would form again. I think it is because those 2 recipes are really for soothing and moisturising your skin if you are already under a psoriasis treatment. Good news is I tried Recipe 4 (Olivia’s special) and replaced frankincense (due to it being expensive) with tea tree and instead of 1 drop ylang ylang, I used 3 drops eucalyptus. About 26 days later, I can positively confirm that I got rid of almost all of my psoriasis. I hope this will help others and I want to thank Olivia for providing all this information. If you really want to you can also get the Psoriasis Revolution book which has some very useful stuff, but that is up to you. Thanks for your contribution. If I may add, you will find both tea tree and eucalyptus in my organic set. I wanted to see if there have been any replies that share the results of using your oils. I see that you have asked for some readers to share the results of using the oils, but I don’t see much in terms of results. I’ve been using oils for a while and I’m having trouble getting results. It would be great to either get more guidance or understand how the application is best accomplished to actually see results. Thank you for your time and for the option you are offering to deal with this issue. Sure, I’ll post your comment and let’s wait for some responses from my loyal customers. As far as I know, there has not been complaints about the recipes not being effective. 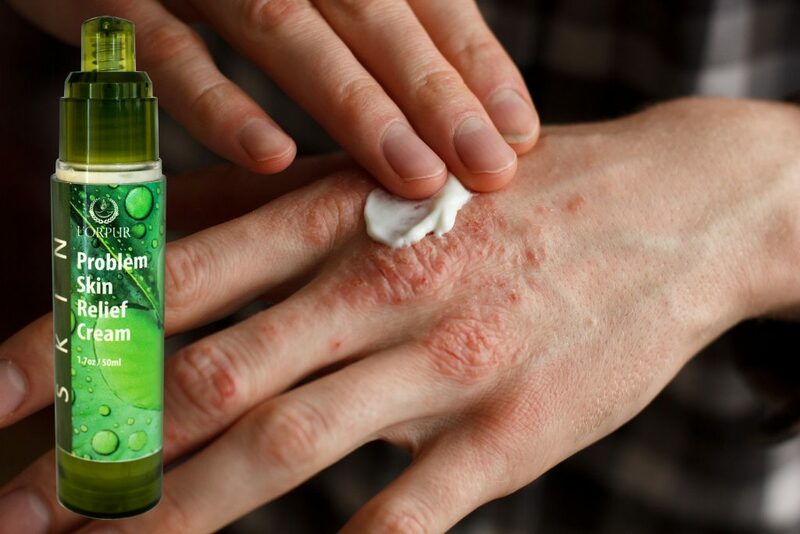 Also, H-Psoriasis is an excellent product for psoriasis with multiple great reviews. You mention that exposure to sun makes the psoriasis rash get worse. I feel you missed the mark on this. 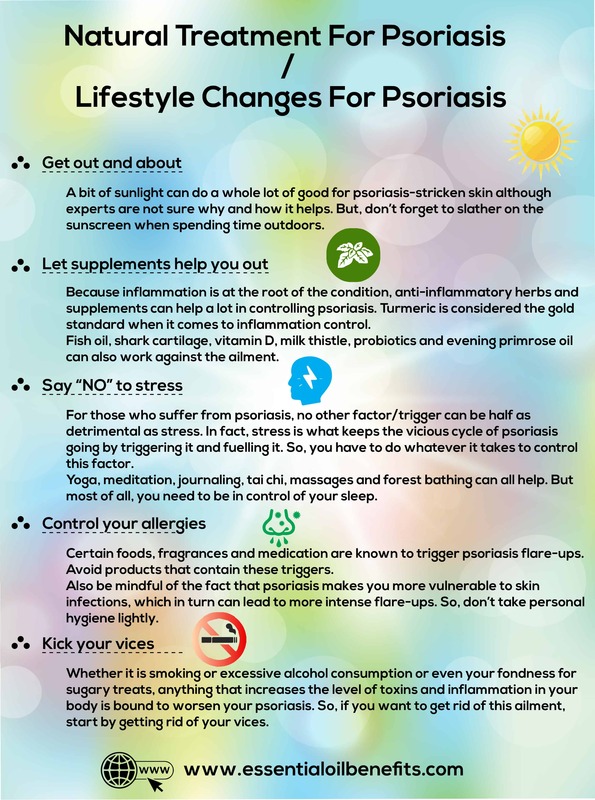 The sun has been the only natural thing that improves mine, and many others psoriasis flares. What is your reason for believing this? Thanks for your comment about sun exposure and psoriasis. You can use 4 drops each of lavender and tea tree, 5 drops each of bergamot and patchouli in 30ml jojoba oil. Apply to the affected areas 2-3 times a day. If she is going out in the sun, do not use the bergamot in the recipe, simply add 2 extra drops of the other essential oils to compensate. I am just beginning to work with essential oils, so am searching for as much information as possible. This article has been very helpful and I have used the recipe for ointment as a guide to make it for myself. One thing I don’t see mentioned is a suggestion of a regular meditation practice. In most cases, stress is a major factor in psoriasis. Regular meditation brings calming and greatly reduces stress. I recommend that anyone suffering from psoriasis add meditation to their regimen for healing. You are welcome. You are absolutely correct, meditation should form part of our daily rituals. Thanks for your input, really appreciated. I need an EO blend that is effective for psoriasis AND safe to use while pregnant. Nothing pre-made is available so I’m going to make my own. What EO’s and ratios are recommended? Where can I purchase a good quality Mandarin oil please. Doterra doesnt have one. I have all the other oils for Olivia’s recipe. Sure, you can buy organic mandarin essential oil from the link below. I’ve had Chronic Plaque Psoriasis since 2008, and am trying to ween off my very expensive, invasive, subcute medicine for something more homeopathic with less long-term side effects. EOs are on my mind – but please, please, please adjust the language in your opening paragraph. Psoriasis is NOT a skin condition – in layman’s terms, it’s an auto-immune disease with crazy inflammatory symptoms that starts from the inside and makes its way to the surface. It can be temporarily relieved topically, but everyone who suffers from any form of psoriasis should aim to medicate internally. It is largely genetic, and there is no cure. Thank you for your blend recommendations. I would also encourage you to take into account the brands of oils and their distillation processes. Often, key ingredients that are anti-inflammatory are lost in the hydro distillation/steam distillation process and render the oil generally useless for this case. Much to my chagrin. Anyway – thanks again. Just some notes from a person who’s going on 10 years of suffering from Psoriasis. Thank you so much for your comment and for sharing your personal experience of psoriasis. I really feel for you going through this for the last decade. I will make the necessary change as suggested. If you are willing to try essential oils, please use therapeutic grade only or you are after a pre-made blend, you may give H-Psoriasis a go. If you need additional help, please do not hesitate to reach out. Olivia you are right that psoriasis is an autoimmune disease. You are also right that it is largely genetic however having the genes does not mean that one must necessarily have psoriasis. A change in diet along with the appropriate supplements can eliminate the disease. I suggest you find a competent local holistic functional medicine doctor to help find the right plan for you. Best wishes. Sorry that last post was meant for Sadie. Thanks for sharing your thoughts and comments. My husband and son suffer from psoriasis. My husband’s did not show up until he was 50 years old. My so has battled it since he was 8 years old. Their psoriasis is plaque, mostly elbows, knees, scalp, trunk ankles, feet and hands. Patches are dry, flaky and unsightly. Which blend would work best in their case? Thank you so much for posting these! Blend the above oils thoroughly and store in a jar. You may want to keep it in the fridge to avoid it going rancid. Otherwise use jojoba oil instead of coconut oil. Apply 3 times a day to the affected area. As always, make sure to do a skin test patch before application. You may also try H-Psoriasis in case you did not want to purchase the above oils. I also suffer from scalp psoriasis and need to know how to eo’s in my shampoo. Could you help me with this? Thanks! You can simply add your preferred essential oil in the bottle of shampoo. I would add approx. 10 drops of essential oils per ounce (30ml) of shampoo. If you have an 8 ounce bottle, you can add a total of 80 drops. I have not had a psoriasis outbreak in over a year, and this is how I did it – warm bath. Take 15 minutes to soak in the warm water. You might find comfort if you add oil, finely ground oatmeal, Epsom salt, or Dead Sea salt to your bath, but keep the water and soap mild. Hot temperatures and harsh soaps can be hard on skin that’s already sensitive. I don’t get outbreaks anymore. Good luck! Thank you for sharing your experience and how you overcame psoriasis. do you have your psoriasis under control by just taking the regular baths? Could you please be more specific re what ingredients you commonly add to your bath? I understood that most common for you is just to have a bath in warm water, is that so? I am intrigued, how severe was your P before and do you live in mild climate – i.e. what about winter time when outbreaks are just more common and were you able to control it just thru baths, or do you follow a strict diet too? I have posted your comment in the hope that Barb answers your query in a bit more detail. Foods to consume include whole grains, lean meats, fruits and vegetables. Foods to avoid include fried and sugary foods, alcohol, and dairy. I got psoriasis at age 50 and I am not sure why but it is not getting better and I have tried everything. I tried a crème today with lavender oil as the first ingredient and it seemed to calm it and help pretty quickly, my main issue is the itchiness of it and of course the unsightliness of it. I have a lot of lavender growing up north in the driveway of my cottage….could I use this somehow or what is an easy lavender oil recipe I can make without too many ingredients….which base can I use and maybe just add lavender oil. Any help would be great. You can definitely use lavender as the main ingredient in an essential oil recipe to help with psoriasis. Please read my post below for a list of essential oil recipes. For a recipe that has the least number of ingredients, you could start with Recipe 5 and let me know how you go. I’m actually looking for an oil(s) for treating outbreaks from dermatomytosis. My sister has it and it is very painful. She gets outbreaks in her scalp which cause a lot of itching. She now has scarring over pretty much all her body. My apologies, I am unable to help you in this case. I am sure that it is treatable by a medical professional. Thank you so much for the great article. What would be the best recipe for psoriasis on the face? I’m partial to tea tree oil but have heard not to use it around the nose or mouth. Would it be safe if diluted? You could try to mix 5 drops of lavender oil and 5 drop of frankincense oil with 1 tsp of coconut oil and rub onto affected area. As always, please do a test skin patch before application especially given it is on the face. Tea tree oil can be used undiluted, but I would be very careful before using it around the face just in case of adverse reaction. I trust this helps. Let me know if you need more information. If you are using essential oils or a particular essential oil for the first time, it is recommended to do a skin test patch over a 24 hour period. Make sure to keep the area dry during this period. If you notice any reaction/irritation, wash with soap and water. I have pustular psoriasis. Will any of these work for me? I see no reason why you can’t use the same essential oil recipes for pustular psoriasis. Let me know how you go after you have tried the recipes. People with Psoriasis can try a blend of Certified Pure Therapeutic Grade Oils..there is a recipe i found on pintrest using three of their oils on the psoriasis on my inner wrist and wrist bone area. ***store in an amber jar with a screw on lid and may need to be refrigerated to avoid a less melted form when applying. Thanks for the recipe. Really appreciate it. There are 3 recipes using Tea Tree Oil within this post. You could try either of them for scalp psoriasis. You could also make up Recipe 4 within this post and apply this blend twice a day on the affected areas. 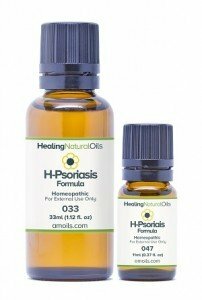 Another option is to try H-Psoriasis Formula from AMOILS. I have psoriasis under my arms and breasts but it is mainly on my scalp. What do you recommend without damaging my hair (since having this, I loose a lot of hair)? You can find more information from my other article “What Are The Best Essential Oils for Scalp Psoriasis“. I have hand and foot psoriasis. My feet hurt so bad all the time. Can’t use anything with perfume. Will these oils help me? Thanks for your comments. 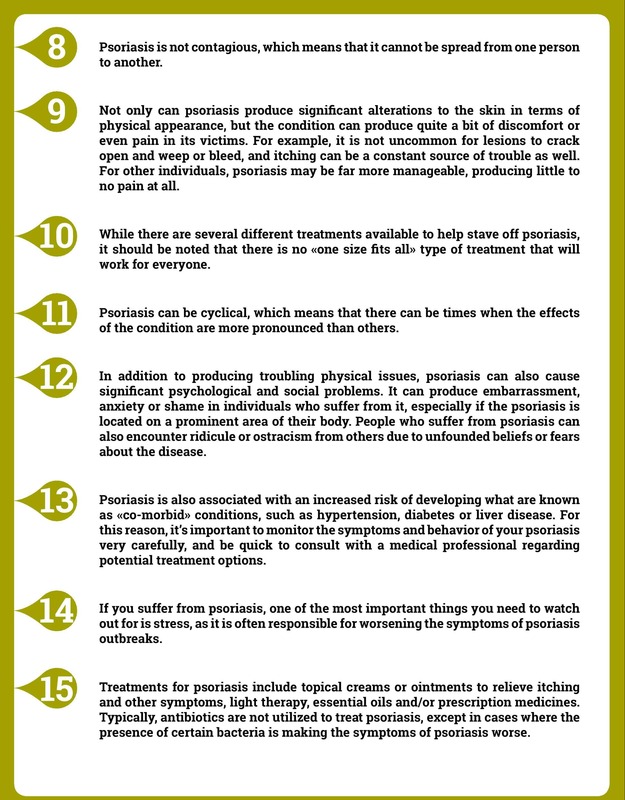 There is currently no cure for psoriasis. The best way to treat psoriasis symptoms and some other skin issues is naturally. With Amoils H-Psoriasis, you will be able to get rid of psoriasis symptoms such as pain and irritation quickly and naturally. It is an all-natural product which is safe to use, and will help soothe your skin rather than irritate it further with harsh chemicals. Give it a try and let me know if it helps. Hi i have hand and foot psoriasis. My most recent flare up has meant i have been signed off work since 2nd December. Nothing the doctor has prescribed has helped. The cracking and bleeding on every finger is so painful. Recipe no 4 has been amazing i can’t tell you the improvement after just 2 days of use. No pain no bleeding. And my skin is pink and healing. I also had a dead sea salt and essential oil bath using 500g of dead sea salt and some oils. And i am taking probiotics and milk thistle. But recipe no 4 has been like magic for my skin. I wish i could add photos to this to show the difference….. Thank you so much for sharing this i will be forever grateful. Thanks a lot for sharing your experience. I am indeed very happy that you have finally found relief for your hand and foot psoriasis. Thank you so much for this valuable recipe. Made a huge difference for my Dad who has struggled with Psoriasis on his hands for years, to the point that he couldn’t even do his normal job and had to make career transitions. Amazing how quickly he saw results. Thanks for the work you are doing here. Excellent and informative post! I have loved using essential oils for a few years now. My favorite has to be lavender oil because it is used for so many different things. I like using it for my anxiety mostly but topically, it gives such a deep and clean moisture. I mix it with castor oil myself. Rated 5 our of 5!!! I never knew there were so many different types of oils to treat psoriaisis. Going to have to pass some of these recipes along to friends. Thanks for your comments and I am glad that my article can help more people! I feel like coconut oil is pretty much the solution to EVERYTHING! Do you have a favorite oil out of your list that you use as a go-to? I had no idea essential oils are such an effective solution for psoriasis — thanks for sharing! I am trying to put recipes 2 together for my wife, and was wondering what type of oats I can use? You can use 100% natural unflavored oatmeal or ‘colloidal oatmeal’. You may be asking what on earth is ‘colloidal oatmeal’. In simple terms, it means oats ground into a very fine powder. To make this, take large flake oats and grind it in a blender until it becomes like dust. You can sift it if required, but not necessary. When this is added to water for an oatmeal bath, it will create a milky mix. I am highly alarmed at the advocation of using eucalyptus in food as I was taught this oil is highly toxic if taken internally and should be avoided if there is a possibility of children ingesting it! You are perfectly correct. Eucalyptus oil should not be ingested (via the mouth) or applied topically (skin application) full-strength. It must first be diluted for safety reasons. If Eucalyptus oil is contained in pharmaceutical products at the recommended rate or taken at low dosage internally, it is safe for adults. Children should not be ingesting it. No one in my family has psoriasis but after a stressful period going through a divorce, I ended up with it. Thanks a lot for these recipes, I didn’t know you can use essential oils for treating psoriasis; will give these a go and see if I notice any improvement.